Thank you so much for staying with us this summer. Our mission continues to survive by a whisker, and your help and your prayers are appreciated far more than we can express with words. We rededicate ourselves to our consistently award-winning programming, while legally separating from the Diocese of Fairbanks as directed in their reorganization plan set down by the court. Nonprofit KNOM Radio Mission, Inc. has been established to help guarantee the station’s continued success and future. Our donors and listeners will see no change as we continue to broadcast the Mass and Rosary, air educational and inspirational spots and provide a high level of personal and public service that remote villagers count on throughout 100,000 square miles of road-less Western Alaska. Thanks to you, KNOM has been a self-supporting radio outreach, in a vast area where priests and sisters are few and the distances they travel are extreme…especially during the challenging winter months. Thank you for helping KNOM minister to the people in this very remote part of the United States! What a wonderful difference you make in the lives of thousands of isolated families every day. July 14th began KNOM’s 40th year on the air. The one message we hear from our listeners and we especially heard during an open house on our anniversary is, “We need you! We need KNOM!” Again, thank you! 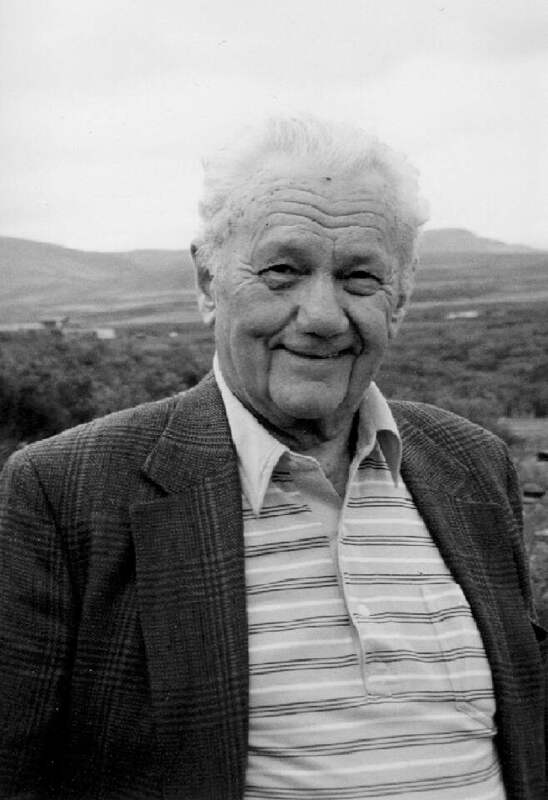 On the station’s 40th anniversary next year, we plan to dedicate the facility to the memory of A. G. “Augie” Hiebert, the pioneer Alaskan broadcaster whose hard work and connections in the broadcast industry were vital in the establishment of KNOM. Hiebert (left, on KNOM's 25th anniversary, July 14, 1996) built the first radio station in Fairbanks, and the first television and FM stations in Alaska, and as a dedicated Catholic, threw his weight behind the Nome radio project starting in 1967. If you’ve ever thought of flying to Nome to visit KNOM, you’re warmly welcome any time, but you might especially consider next July 14th! (Left) From Bethlehem, Pennsylvania, Leo Kehs was the narrator for KNOM's inaugural broadcast. The oldest Catholic radio station in the United States, KNOM beams strong 24 hours a day, thanks to the prayers and the kindness of good people like you. Thank you! NEW TO KNOM but not to radio, meet incoming volunteer Ben Matheson (left). Signing on as news reporter, Ben is a graduate of Luther College in Decorah, Iowa with a degree in communication. 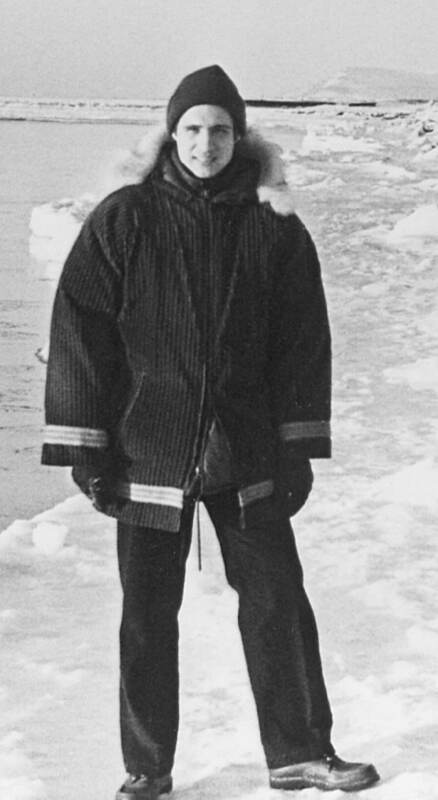 Ben was active at his college radio station, and hit the ground running, announcing a newscast on his second day in Nome. Please join us in warmly welcoming Ben, and thank you for your helping hand in making his work here possible. IF YOU’VE ASKED FOR A BIT MORE INFORMATION on those we serve: Of the approximately 85-90% of the adult population who are daily KNOM listeners, most are Eskimo or Athabascan Indian. Roughly 40% are Catholic and about 60% are Protestant. Most families are deeply religious. Parents share the same concerns as parents everywhere, but endemic poverty and unemployment create serious trouble for elders and children alike. Typical per capita income is less than $8,000. With village food costs more than three times those in the Lower 48, grocery money doesn’t stretch very far. Electric power is five times more expensive. In some villages, heating oil is $8 a gallon. As a result, more than 80% of families look to the land and water to put dinner on the table. Suicide is four times the national average, and accidental death is over three times. According to the most recent data we can find, over half the people who die are younger than 43. According to the University of Alaska, homes are small, and 47% are “substandard.” 36% host two or more families. The average home has 100 square feet per person, 1/5 the U.S. average. With all of the problems they suffer, our listeners are capable, good, wonderfully generous people who do what they can with their limited resources, for example, sharing food among families. To almost everyone, it’s extremely important to preserve their languages and the richness of their ancient cultures. One element of our mission is to encourage and support that. As we reported to you in March, life is improving, and the KNOM mission works hard to be part of the solution. Since we signed on, longevity, while still seven years short of the national average, has improved by ten years. Smoking is down 29%. Accidental deaths are down by 40%. Thank you so much for your kindness to these most far-flung families! INSPIRATIONAL SPOT: Taking up our cross means the acceptance of what is — often quite against our wills — inflicted upon us. But we take it with an openness to the possibility that out of that affliction a blessing can be extracted by God’s grace and with a little imagination. 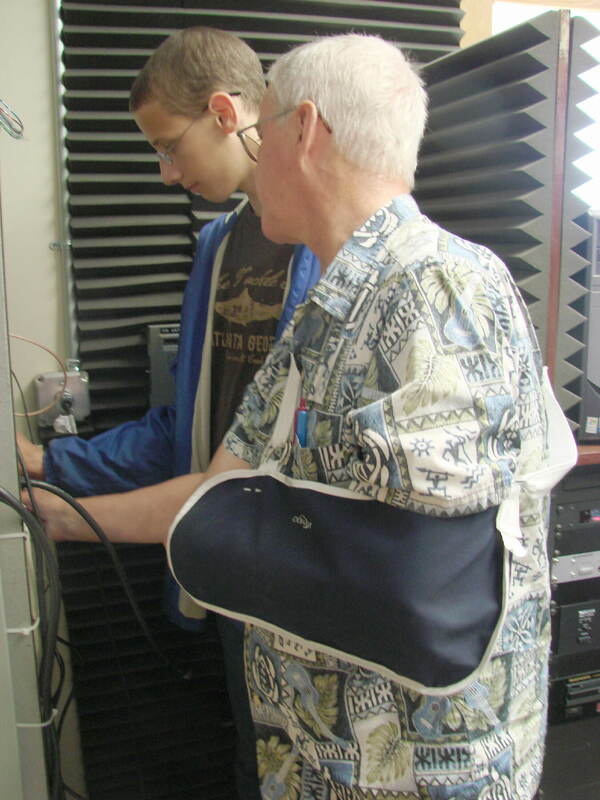 HELPING HAND (left): 16-year-old Tim Schmidt, son of KNOMers Ric and Lynette, helps Tom Busch install a temporary “loaner” FM transmitter. The permanent replacement for the unit that failed is expected to arrive by August. Tom taught Tim, who is very handy with tools, how to use a soldering iron, and the young man was a quick student. “Tim’s only failures were due to inadequate instruction,” Tom says. The transmitter which quit working is not repairable in the field. Before this installation, the FM, which simulcasts the AM signal just to Nome in high fidelity stereo, was at 10% of its normal power. Tom is in a cast for a month, following successful surgery for carpal-metacarpal arthritis of the left thumb. Recently, he was re-elected co-chair of the Alaska Public Broadcasting Commission, the board which distributes funds from the State of Alaska to public stations (which KNOM is not). One listener brought a “KNOM Early Bird” lapel pin from Alex Hill’s 1971 morning show. On KNOM’s morning program, volunteer Danielle Sylvester gave prizes for correct answers to KNOM historical trivia. 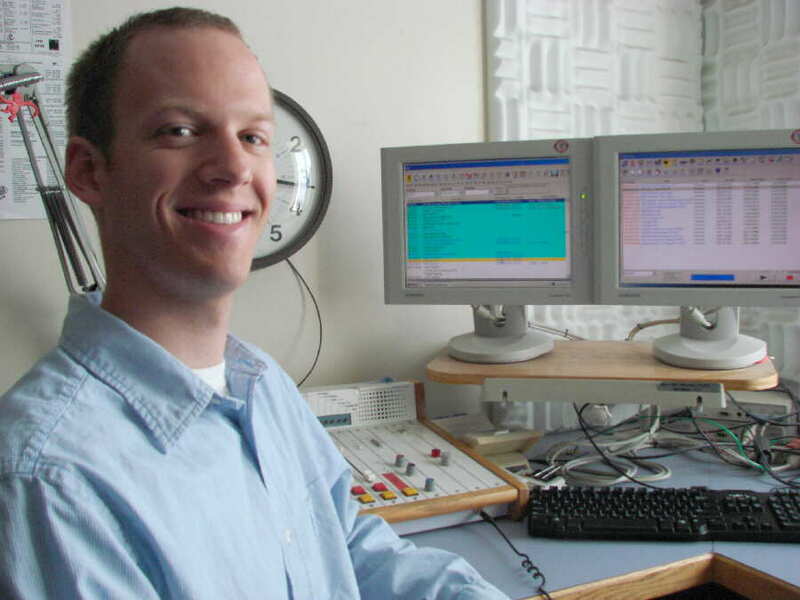 Several listeners commented, and more telephoned with thanks, for general manager Ric Schmidt’s conversations with old time KNOMers over the phone, and for airing segments from the station’s first broadcast, such as a letter from Richard Nixon, a minute-long welcome tape with the voice of Pope Paul VI, and recorded wishes by Bob Hope and Bing Crosby. FISH STORY: (left) KNOM volunteer inspiration director Danielle Sylvester enjoyed a visit by her dad Bill this month. Here, they show off grayling caught in the Niukluk (NYUK-luk) River, about 70 gravel road miles northeast of Nome. Please consider adding the KNOM radio mission to your will. Thank you. God bless you! Open my heart so that I may lovingly accept the difficulties, blessings and surprises that You so lovingly will provide me today. Amen. August 28, 1970, Acting Secretary of the Interior Fred J. Russell signs off on a modification of the federal Alaska land freeze. The summer construction season is almost over, and the Catholic radio crew eagerly await permission to develop the transmitter site. They are determined to build, even if it means working outside during a legendary harsh Nome winter. THIRTY YEARS AGO: It’s clear that the mission could economize in many ways by using a computer. Chief engineer Bro. 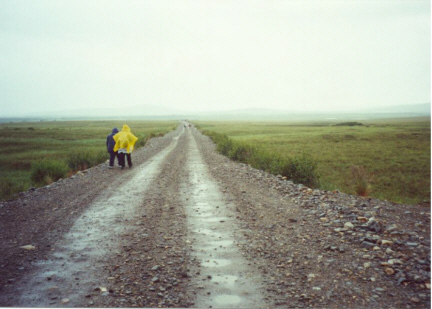 Normand Berger, FIC (left), travels to Anchorage to investigate. Also in August 1980, KNOM installs a recording wind meter at the transmitter site, guided by Alaska Geophysical Institute professor Tunis Wentink of Fairbanks. After a year of data, Wentink determines that powering the transmitter by wind is technically feasible, but impractical due to maintenance costs. 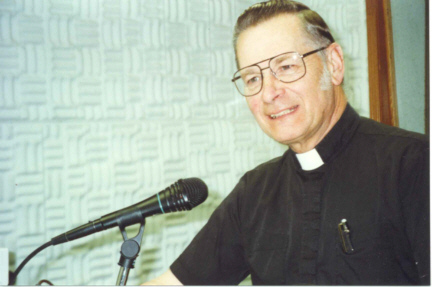 TEN YEARS AGO: August 12, 2000, KNOM broadcasts Bishop Michael Kanieki, SJ’s funeral Mass live from Fairbanks. 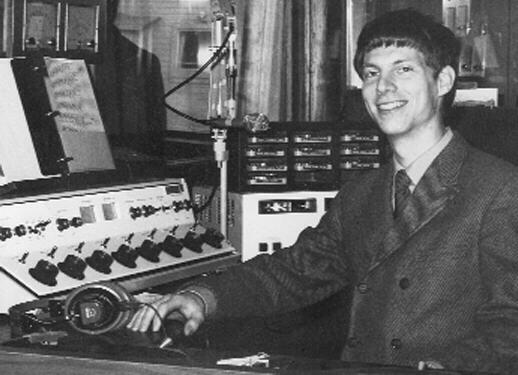 The program is produced by Fairbanks broadcaster and former KNOM volunteer Peter Van Nort. KNOM general manager Tom Busch is among the late bishop’s eulogists. “Mike, you did a great job,” he says, and the congregation applauds. (Left) Bishop Mike on one of his visits to the KNOM studios. 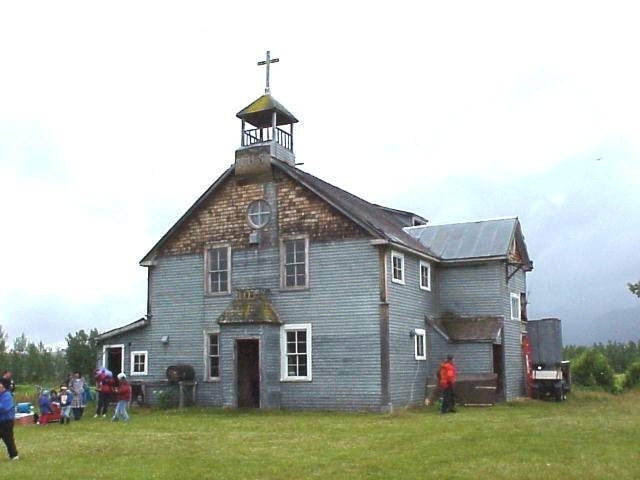 Also this month, using a satellite telephone, KNOM broadcasts the St. Joseph parish Jubilee Mass from the former Our Lady of Lourdes chapel (left) at remote Pilgrim Hot Springs, about fifty miles north of Nome. Pilgrim was a Catholic orphanage set up in 1918 to house children whose parents died in the influenza pandemic. Among the orphans was King Islander John Taxac (left), seen here praying at the Jubilee Mass. Operated by Jesuit fathers and brothers and Ursuline nuns, it closed in 1941..
Before Mass, worshipers (left) walk eight miles along an access road in drizzle, praying the Stations of the Cross. It's grizzly bear country, and KNOM staff provide public safety via amateur radio. If each KNOM spot were written on a single sheet of paper and they were piled together, the resulting stack would be 520 feet high! YOU REMAIN IN OUR THOUGHTS AND OUR PRAYERS. We repeat what we have said many times. You are our strength. It is upon your strong shoulders that we stand. It is only because of you that our work is possible. Thank you again, so very much. And please know that we keep those whom you love and your intentions in our prayers also. Until next time, may Our Almighty Father smile upon you!